Oh afternoon tea, how you spoil us! This wonderful dining activity dates back to 1840, when Anna, the 7th Duchess of Bedford, grumbled that she was a little peckish in the middle of the afternoon. At this time, those crazy folks only enjoyed breakfast and dinner, so the duchess chose to have a light snack and a pot of tea to eliminate those hunger pangs. And so afternoon tea was born! Afternoon tea has become quite popular in recent years, and many hotels, bars and restaurants can’t resist putting a modern spin on the tradition. So, take a look at the top 4 quirkiest afternoon tea rooms in England. Forget the chocolate factory, if there is one place you want to visit to really be spoilt, book Charlie and the Chesterfield Afternoon Tea at the Chesterfield Mayfair Hotel! 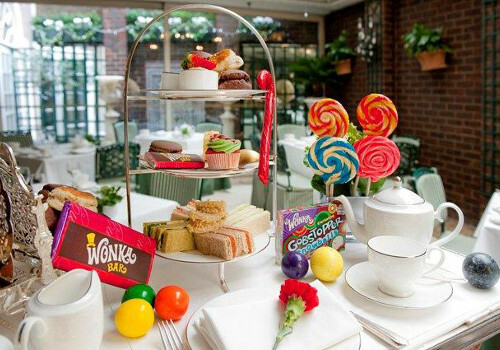 Offering a fun and intimate experience, guests will be treated to a shot of Fizzy Lifting Drink upon arrival at the London hotel, and will also be able to choose from 18 loose teas – including a very special Willy Wonka chocolate tea. Yummy! Now, onto what you really want to know more about: the food. On top of the traditional finger sandwiches and jam and cream scones, you will receive an everlasting gobstopper and a lollipop at the end of your meal. The perfect afternoon tea service for those with a sweet tooth! If the thought of finger sandwiches and scones doesn’t appeal to you, you have to visit the Baltic Social in Liverpool. 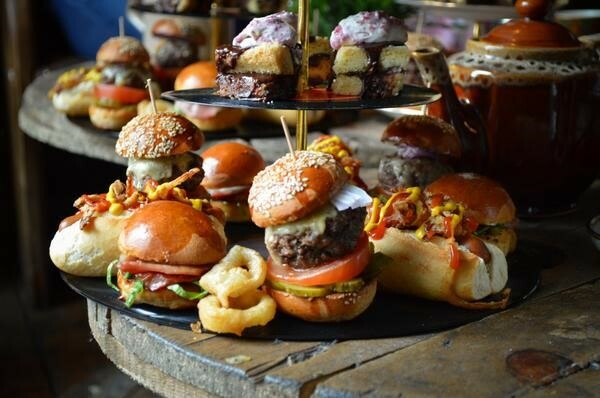 It’s a modern twist on a traditional dining experience, offering mini hot dogs, burger sliders, onion rings, coriander fries, homemade popcorn and not forgetting delicious chocolate brownies with a caramel dip. Drool! Are you a veggie? Not to worry! They also do a vegetarian afternoon tea option of homemade veggie burgers, halloumi and veggie hotdogs. For afternoon tea with a twist, you will love The Crazy Bear Hotel in Beaconsfield, as they offer dim sum afternoon tea. You can share 24 award-winning savoury dim sum parcels with your loved ones, as well as a scrummy raspberry ripple cocktail that’s served in a teapot. You will also have an extensive choice of organic and fresh teas for a truly enjoyable dining experience. 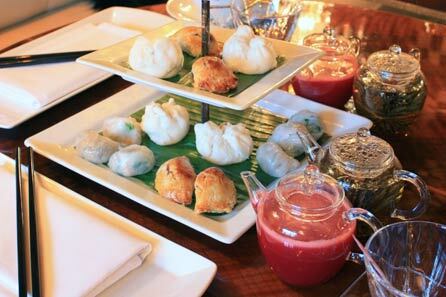 Dim sum afternoon tea is available for £39.50 per person, and there is a minimum booking of two people. However, they do also offer traditional afternoon tea for those who want to stick with tradition, which is priced at the lower price of £29.50 per person. 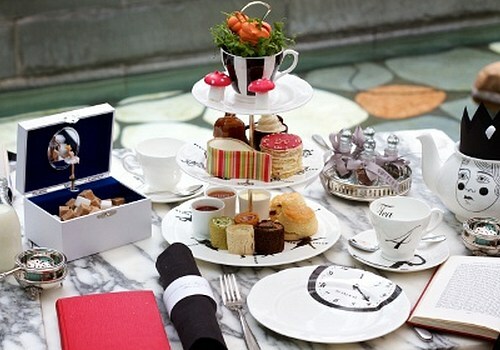 When you think of Alice in Wonderland, you will most likely think about afternoon tea – and vice versa. The two go hand in hand, and so it makes sense that there are numerous Alice in Wonderland afternoon tea themes across the country. No-one, however, does it quite like The Sanderson. Menus will be served inside vintage books, whilst you will have a good laugh when reading the many riddles wrapped on the napkins. The teapots are also decorated in Kings and Queens to really make you feel as though you’re in the Lewis Carroll novel. The food also doesn’t disappoint, as The Sanderson offers strawberries and cream marshmallow mushrooms and the unforgettable melting mango cheesecake. Did we mention it’s coated in a rainbow patterned white chocolate? While you might squirm at the £48 price, it really is worth the extra cash. Trust us! 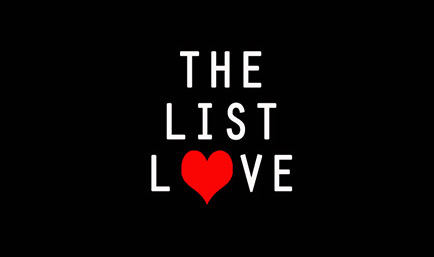 Please follow The List Love today on Facebook, Twitter and Google+ for more food and travel tips and facts.